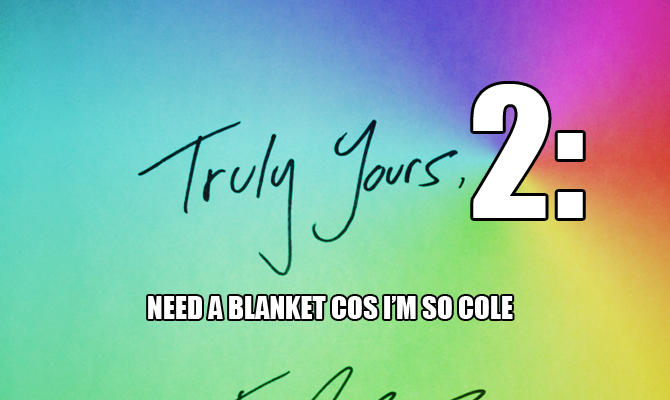 RAWFUNNYTRUE: RFT News: New J Cole "Cole Summer" - Truly Yours 2? RFT News: New J Cole "Cole Summer" - Truly Yours 2? HUZZAH! Last night J Cole dropped a new single by the name of Cole Summer (gotta love a good Cole pun) sampling Lauryn Hill and D'Angelo's Nothing Even Matters, which you can listen to below. It's a nice chilled song with a focus on Cole's conversational and lyrical style, leaving you hungry for some more Cole cuts in the run up to Born Sinner. And as if he knew I was going to type that, what does Cole go and tweet? In one word - OMGOMGOMGOMGYAAAY! In case you missed it, Truly Yours 1 was pretty freaking good, and we all know how good a sequel can be. Though then again as we all know how good a sequel can be, stay tuned to RFT to find out the verdict when it does indeed (if it does indeed) come out.